Imperial Engineering supplies a full range of brand-new OE water pumps, as well as high quality remanufactured products that are produced to OE specification. Our comprehensive range covers all vehicle manufacturers and models. Furthermore, we can cross reference your part number to ensure the correct replacement unit is supplied. Imperial Engineering offer high quality remanufactured bus water pumps that are produced to OE specification. As one of the UK’s leading bus water pump suppliers, our comprehensive range of bus water pumps covers all vehicle manufacturers and models. 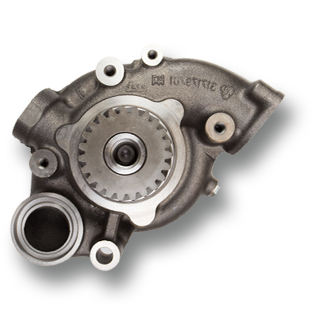 Furthermore, we can cross reference your part number to ensure the correct OE water pump replacement unit is supplied. Our brand-new OE water pumps are imported from original equipment manufacturers throughout Europe and offer the highest levels of performance and reliability. Bus water pumps supplied by Imperial Engineering carry a one-year warranty and these are service exchange items. Keeping vehicles fully operational is critical for any PSV operator at any time and can be particularly challenging during peak periods when passenger volumes increase, placing demands on components such as water pumps, heightening the potential risk of component failure in systems already working at the extremes of their limits. If you have a bus water pump problem, please call us on 01992 634255 so we can ensure you keep your fleet moving.